The Department of Natural Resources in Michigan wants to know… Do you have what it takes to make a home for wildlife? What in the Wild is a game system consisting of a deck of 120 cards and rules for 5 different games. Cards contain plant and animal species and the food, water, shelter, and space they need to survive. Much as with wildlife conservation in the real world, the games of What in the Wild focus on cooperation, collaboration, or side by side competition rather than head to head competition. Each game was designed with children and families in mind, and most have variants that let you ramp up the challenge as players get older and are looking for more strategic gameplay. Match It! A memory game where you explore the different types of habitat elements and which species use them. Connect It! A cooperative game of map building to construct a resilient ecosystem before time runs out. Slap It! A fast paced race to assemble habitat for as many species as you can. Group It! A push your luck set collection game. Build It! A collaborative game of habitat creation. What in the Wild was designed to be easy enough to learn that it can be played with elementary school aged children and challenging enough to win to keep adults engaged. 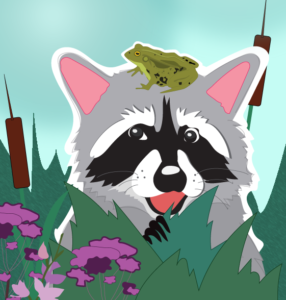 Proceeds from the sale of What in the Wild are used to distribute copies of the game to educators across Michigan for use in their classrooms to complement the Michigan Department of Natural Resources’ “Go Wild for Michigan’s Wildlife” curriculum package.